somebody just handed me one of these and says it is a drop in replacement for the ecc88. Did some search and did find that it is a sub. Has anybody tried it. Yes, in fact Steve is now using that tube in the Zen Mystery Amp (two per channel). I've tried them. . . they're nice but I don't really keep any of the 6922 types in my components, I prefer the 6N1P type. Wow Shreekant, I like to see original Forum members from the past pop up. Yes, like Lon said, you can do, I will eventually get around to hearing the 23p in my SE84CS & CKC. I am having to much fun with the ZMA right now though. yes. I know what you mean.... I have been travelling a busy with work, but have managed to do strage things like build voigt pipes for my pm6a. yes, the hobby in on and really, it feels great when you are welcomed back home!!!! I have been with blh for too long and needed a change.......btw at present my 84c is playing ELO pretty well. Glad you "stopped by!" Glad you're still deep into the sound! Even though I may not have posted, I have been visiting the site quite often. I maybe at a stage wherein I just want to get the best out of my present set up, without any changes. BTW, I did source Maple wood and made my rack. That's great news Shree! I love my two racks, and I'm also trying to be in that "enjoy what you have and relax" stage. Lon, hope we are getting to that stage because of age!!!!!! Well I have certianly reached an age! OK, I'm reviving this thread. This morning I've been exploring this tube. The prices offered seem to vary widely for different years of manufacture and it doesn't seem to follow the usual older is better/more expensive path. I am thinking about these in the CSP3 instead of the stock tubes Steve sends and the triple mica Russian tubes that Syd and I bought...the model number escapes me at the moment. Any impressions or comments would be helpful. Thanks, Mark. It is said that the 6n23p-ev is the best. The ones we bought were the 6n1p-E`s mark. The are the triple mica with gold in the grids I think though not in this ad. Glad you mentioned them as I`d forgotten. I can use the 4 in my Rachaels at some point. The 6n23p`s are the ones that have been bought here with the single wire grey/siver shields `74/`75 and carry hefty price tags. Syd, the pair I bought has never left my CSP3 in the Cave...lol. Maybe I should try the Amperex white label 6922 or 7308 in the output spots...or maybe not :) The listing you gave isn't our seller as you know. Do you remember his name or ebay handle? Mark. This is the seller Mark. I see he has some cheap 807`s I might be interested in. Yes Syd, that's him. Now I remember, I also bought two quads of output tubes for the Torii from him and at the time asked him if he had any more of the small Triple mica tubes...he did not. I searched his current inventory on ebay and they are not there. Click the link and you'll see the listing we bought for about $50 a pair. Wish I could get another pair. What tubes are you running in your ZP3 now? I just put in a pair of Tung Sol 5751's in the second system replacing a pair of Raytheon Black Plate 12AX7s that I hadn't used in years in the ZP3 in the main system...they sounded nice. Mark. Syd, I decided to buy both pairs of the Triple Mica Russian tubes... 6N1P-E E88CC PAIR. BLACK BOXED ANODE 3x MICA ~ Tubes 63 year. I just accepted a counter offer from the seller to buy them. He was the only one who had them currently and I thought I better get some spares. These cost much less than from alexey. $76 for two pair including S&H. I'm still going to buy a pair of the 6N23P-EV ...just curious about them. Mark. If it’s from ’50s then you have best input tube ever made! Only 6n30p from same era is on the same level. But if this 6n23p is modern tube, then it is just average tube, nothing special. I bought some single wire, silver shield Reflektor '74s and '75s before they got above $65 a tube. I haven't experienced that many input tubes (maybe 10 pairs), but these are the best so far and really add a lot of life to my system. So much so that I haven't had the itch to upgrade equipment in months. I have also heard them as an input to a Zen amp and the sound was equally good. Ed, what brand are your 6n23p? 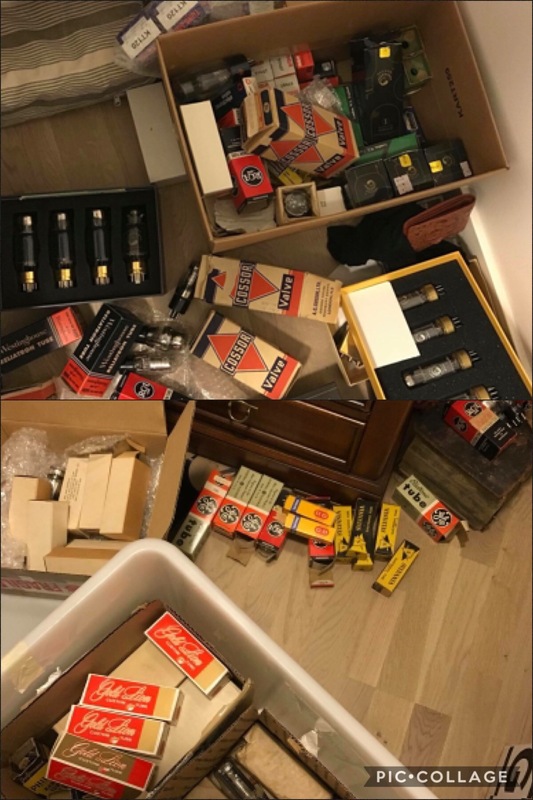 Sorry, I checked the case, these tubes are from 1974 and the brand is VOSKHOD. Best tubes I have ever tried, with zero distorions and noise.